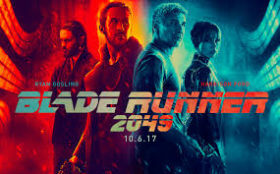 Blade Runner 2049 tells the story of a police officer (Ryan Gosling) in future Los Angeles, a new blade runner, on a journey to find a hidden message that would otherwise destroy what is left of humanity. On his way, he seeks out the former blade runner Rick Deckard (Harrison Ford) and attains information from him that could change the trajectory of life for good. The movie, directed by Denis Villeneuve (Arrival (2016), Sicario (2015)), stars Ryan Gosling, Harrison Ford, Robin Wright, and Jared Leto. Though Scott’s initial outlook on Los Angeles 2019 proved inaccurate in the first Blade Runner (we still await flying cars and a dystopian society today), Hollywood had not failed him in advancing the movie industry so much so that it allowed unlimited control over every aspect of the sequel, taken over by Villeneuve, giving way to a whole new world. Catch Blade Runner 2049 at Arclight, The Chinese Theater, and all other theaters starting tomorrow, Friday, October 6!